This entry was posted on January 26, 2014 by thatpartychick. 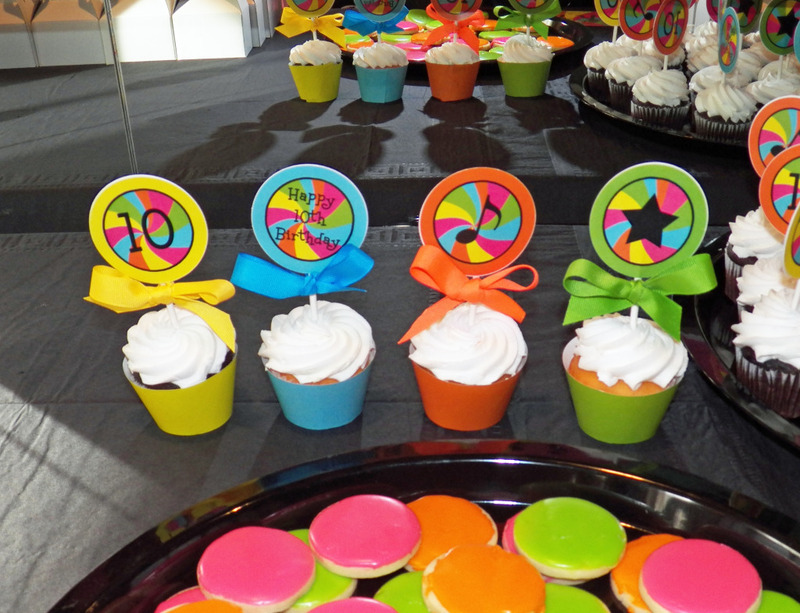 Colorful party styling set the stage for a Neon Dance Party as four girls gathered fifty of their school classmates to celebrate their 10th birthdays! 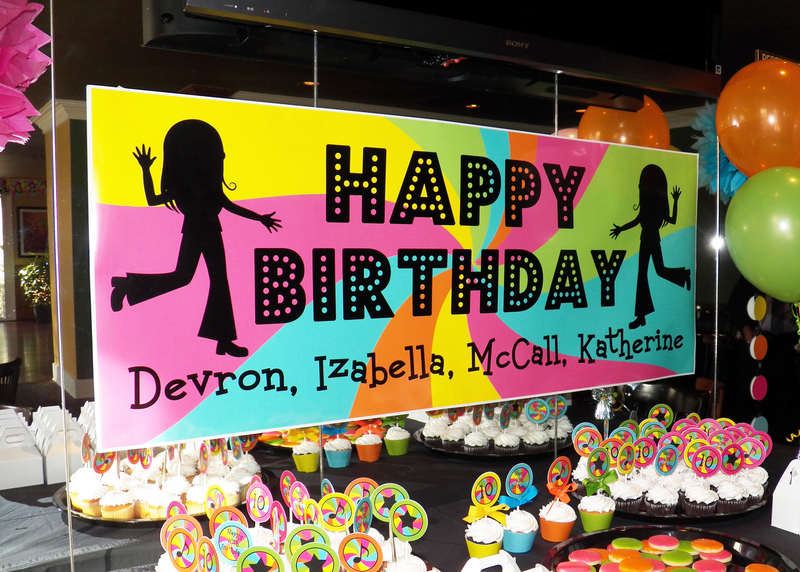 The party invitation featured an orange, blue, green, yellow, and pink swirl with 4 silhouettes representing the birthday girls. 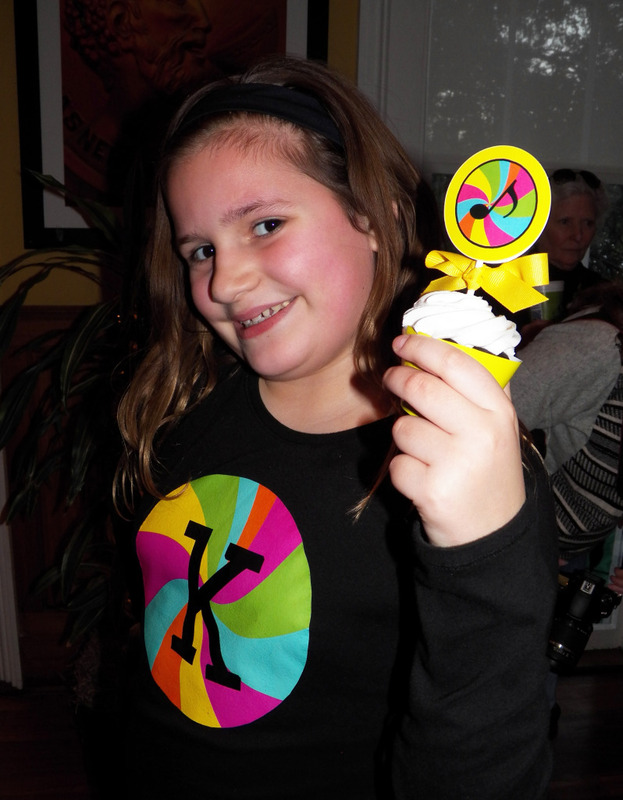 Identifying the party girls was easy as they were dressed in matching black shirts highlighted with an iron-on rainbow swirl and their initial. 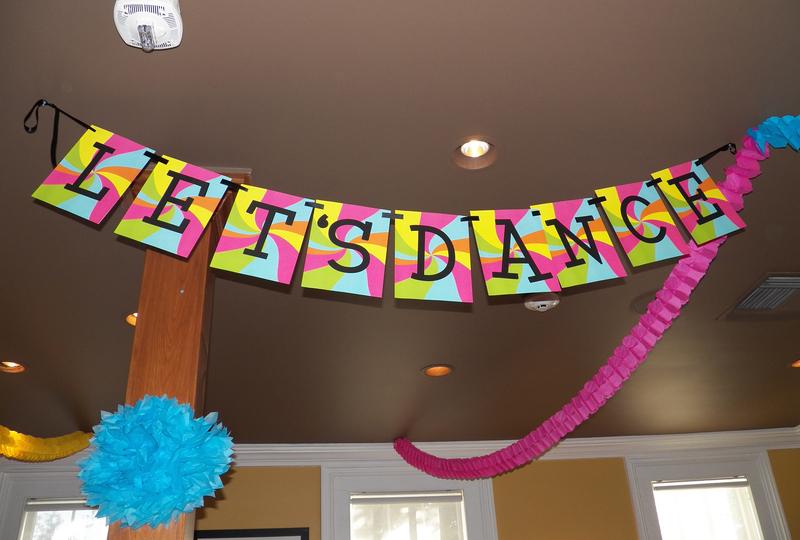 A “HAPPY BIRTHDAY” banner and “LET’S DANCE” banner were patterned in the same bright colors. 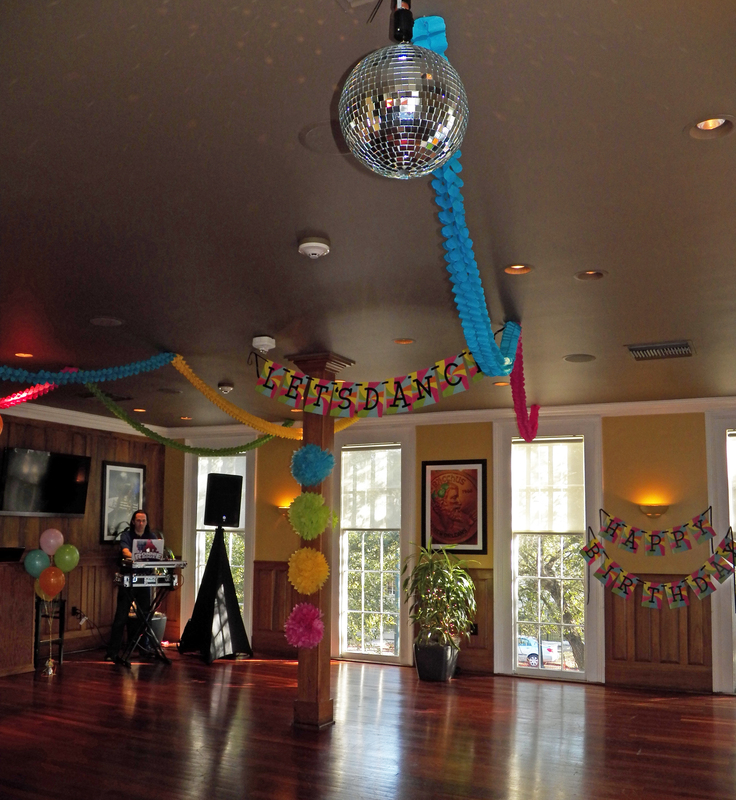 Colorful paper garlands hung as swags from the ceiling, while balloons and paper flowers served as accents. 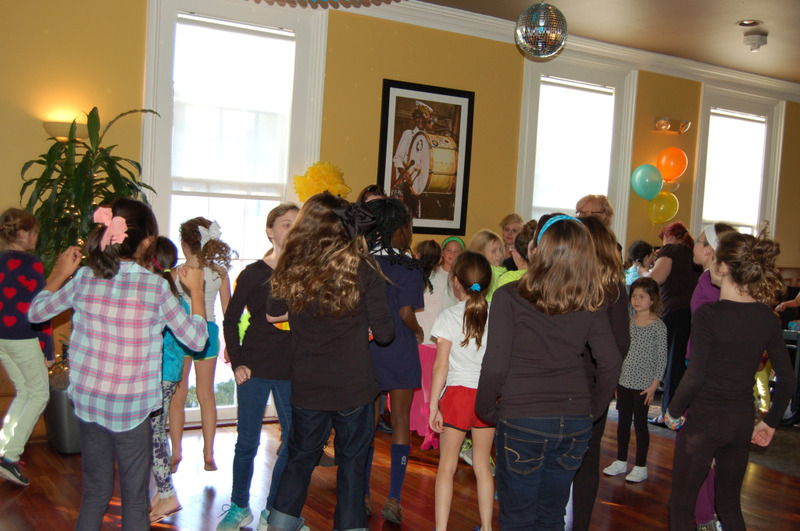 And what dance party would be complete without disco ball or cosmo ball effects! 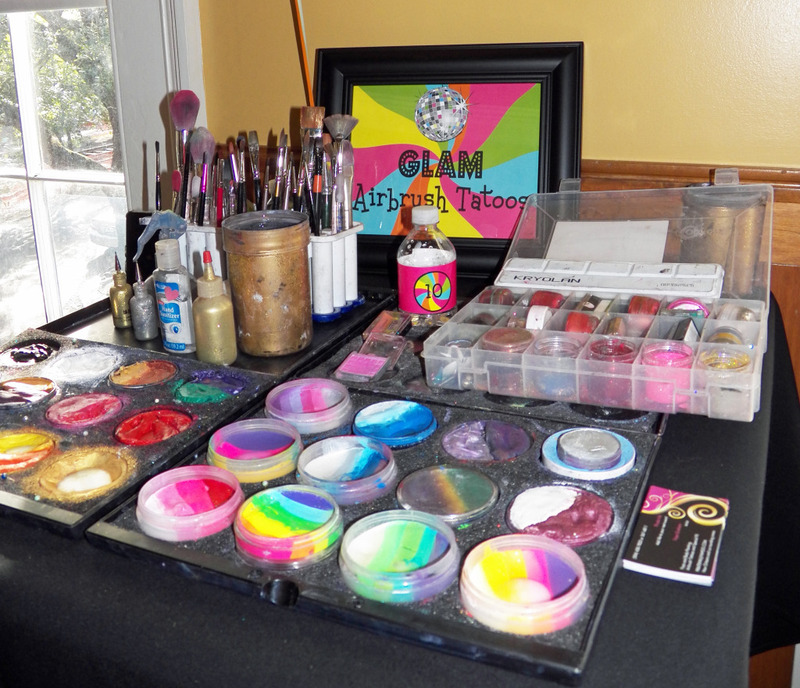 A make-up artist treated the girls to all types of decorative face painting, with each girl selecting a style of art to suit her personality! All that dancing can cause anyone to work up quite an appetite! Chicken tenders, fried catfish, shrimp, French fries, pasta salad, and a fruit tray provided the energy to keep the party rolling! 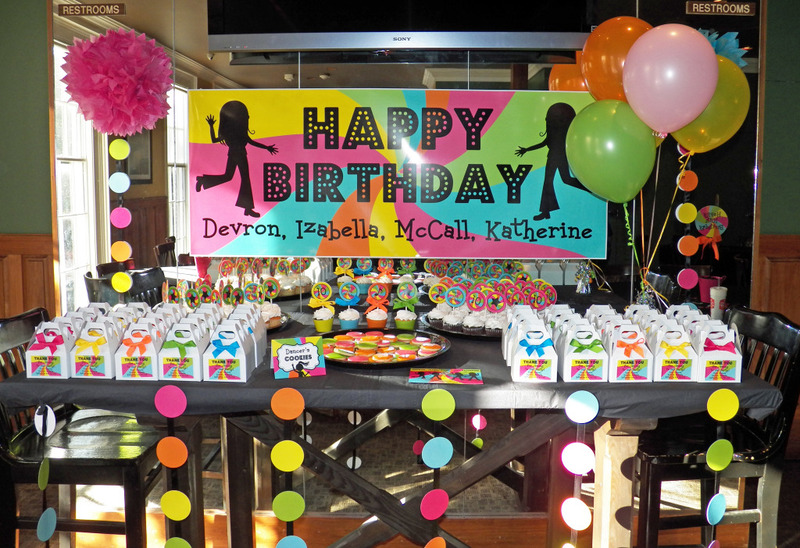 The colors of the geo-bright confetti really popped against the black table cloths. 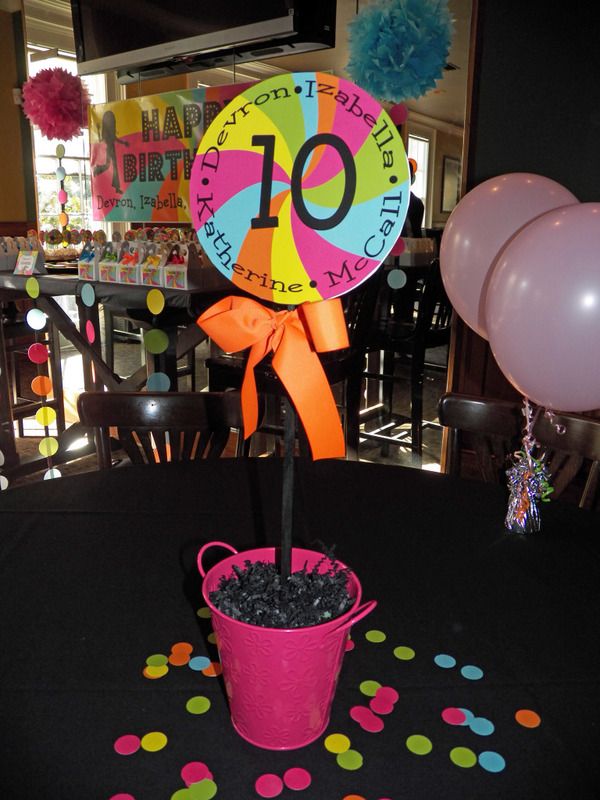 Festive centerpiece toppers decorated with a bow were mounted in pink buckets on each table. 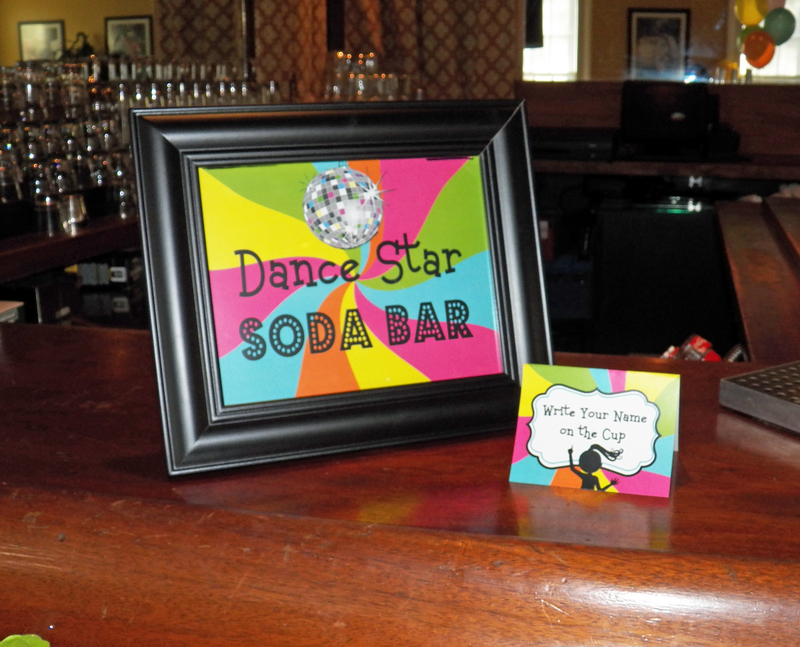 In addition to soft drinks, bottled water with personalized dance party labels were on hand for all the guests. 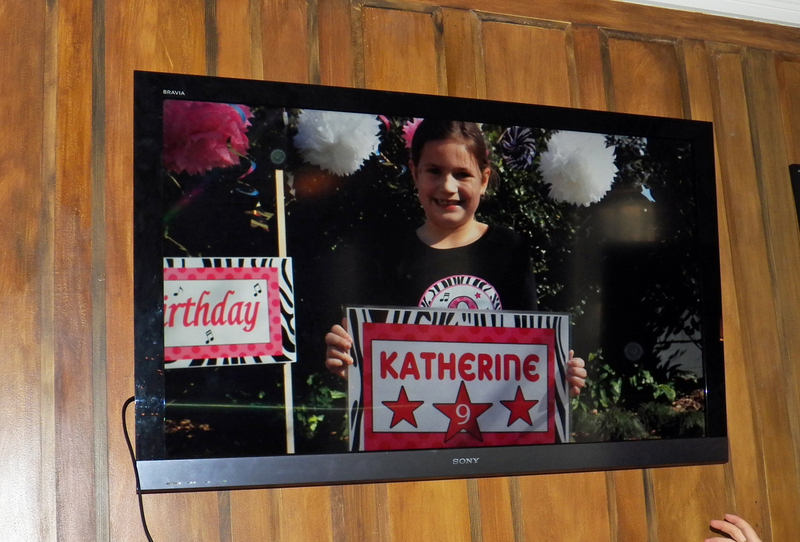 Most of these girls at the party have been in school together for six or more years, and one very special aspect of the party was a running slide show projection of party pictures over the years! The girls loved seeing themselves and remembering the fun parties together. 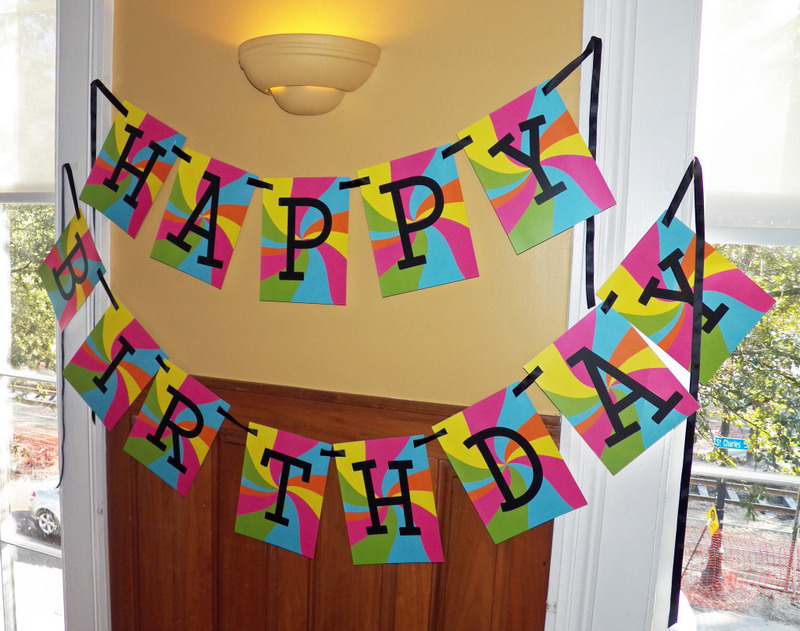 The matching party décor included a Happy Birthday Banner, which hung over the dessert table. 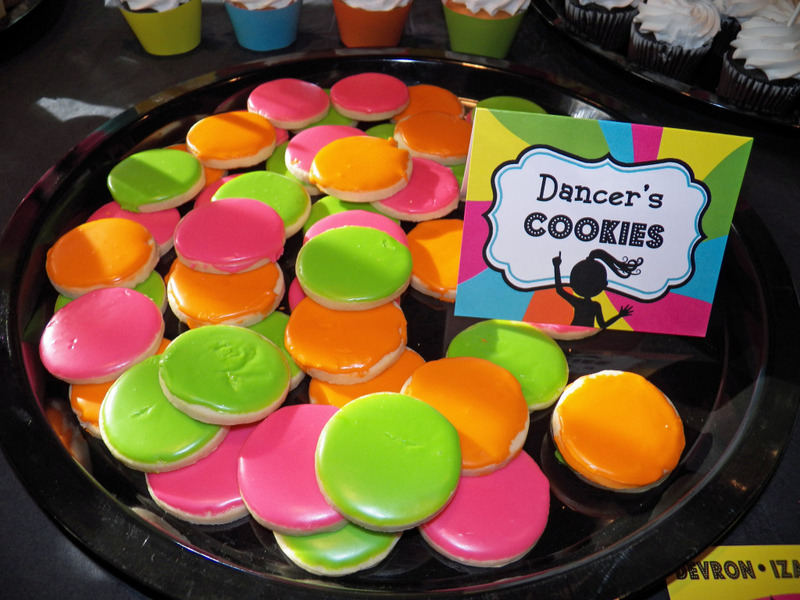 The cookies were simple, but so cute and colorful! 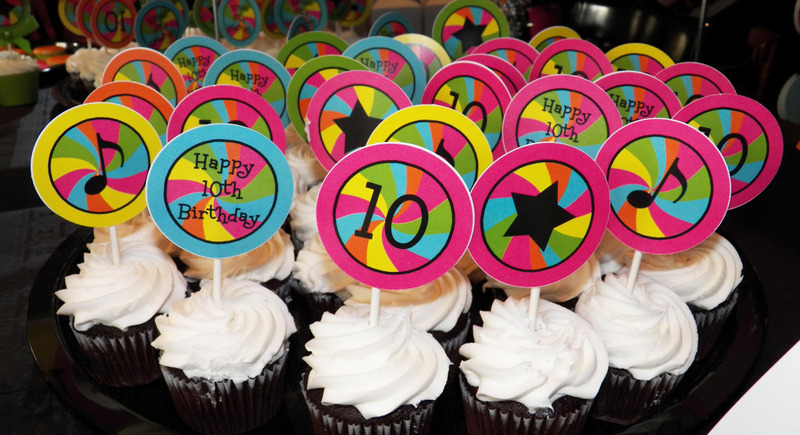 Adorable cupcake toppers featured a variety of images including a music note, the number 10, “Happy 10th birthday,” and a star. Brightly colored ribbons adorned the four cupcakes designated for the honorees. Even the greatest of parties has to come to an end, but the memories of these special moments will no doubt last a lifetime! 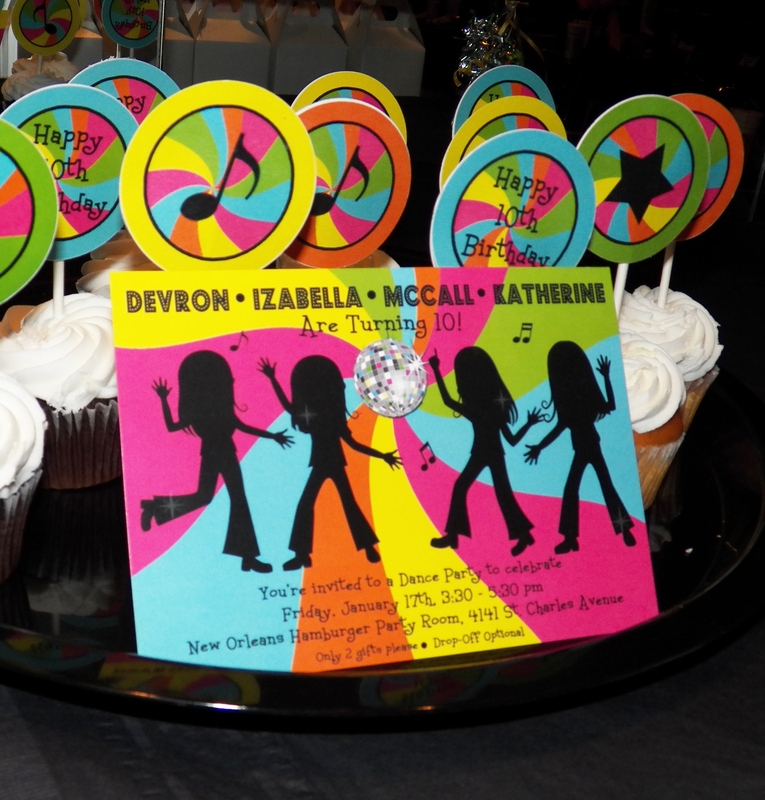 Party Styling and Printables by That Party Chick. What an adorable party! 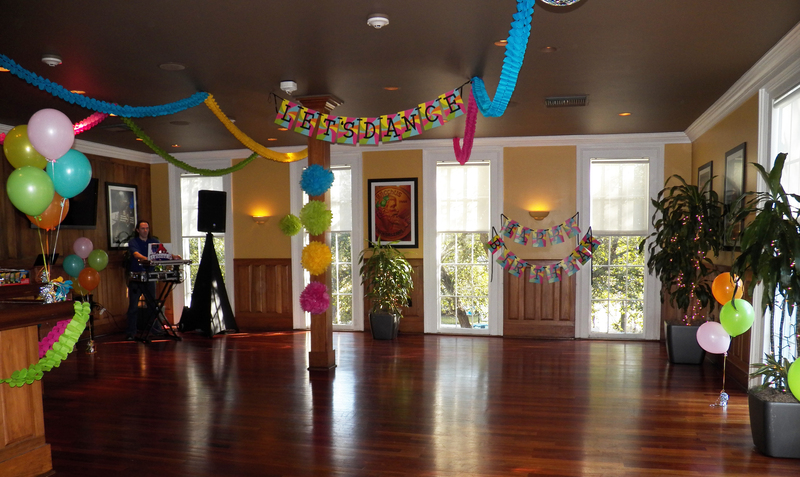 Fantastic decorations and such a great idea to include the slide show of previous years' party pictures! !